Oh BABY!!!!!!! : One of my FAV'S plus winter gear!!!! One of my FAV'S plus winter gear!!!! When I was pregnant I was ALL about comfort!!!!! Especially for my "Flintstone Feet" as I called them because they were HUGE. When I went to visit my very good friend Natalia in Minnesota when I was only about 13 weeks pregnant she had these fab "furry" (as I call them) Crocs!!!! OMG...they were the MOST COMFORTABLE thing I had put on my feet in a VERY long time. So Crocs became my new best friend when it came to my fat, swollen feet. I love these things so much that I wear them year round!!! It is like house shoes for the outdoors. I HAVE to get another pair this year!!!! And a great find is that Finish Line has them online on sale for $10!!!!!!! Just click here to go to their site!!! I HAVE to get a pair just to wear in the house...and a new pair for this winter!!!! So I knew this winter that I was going to be taking Aiden to Minnesota a few times and wanted to see if they had the "furry" Crocs in his size...and what did I find???? They HAVE THEM!!!! 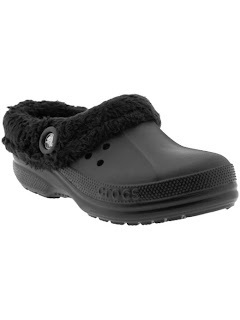 And they have them in a shoe style (Dawson)and slide ons...those people at Crocs are genius'!!!!!!!!! 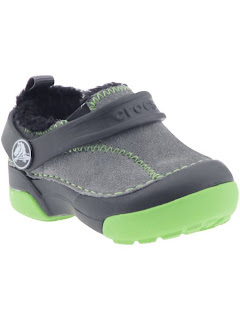 So i am going to get Aiden a pair of the Dawson's for this winter!!! I can't wait!!!!! Too bad they don't have these on sale anywhere!!!! Oh the little things in life that we Mommy's get excited about...lol. 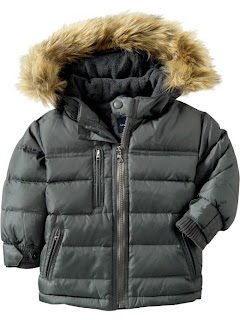 I am also picking out Aiden's winter coat for this year. Being in Atlanta it does not get REALLY cold, but he needs to have a coat in addition to his jackets due to the fact of us visiting Minnesota in the fridged winter months!!!!! I think that I have made my selection...last year I got Aiden the cutest suede toggle coat with the furry lining from Gap on clearance for like $19...LOVED THAT COAT...unfortunately I left it in the airport on our way back from one of our Minnesota trips...lol. 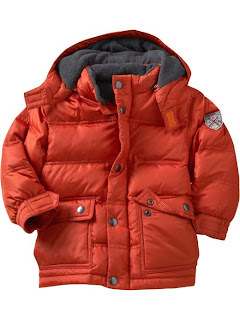 So this year I will be going back to one of my fav places to buy Aiden's clothing (Gap Kids) and purchase him the "Warmest Jacket"...the only thing I need to decide if I want to get him the classic version or the Furry one. Oh, decisions decisions!!!! Another thing I am excited about when it comes to winter is all the CUTE hats that Aiden will wear. He is definitely a hat kind of kid and last year his hat game was on point...this summer not so much!!!! I get a lot of the hats from Gap Kids (no surprise there) because they are so stylish and you can always get them on sale!!!!! Maybe this year Aiden will be more cooperative when it comes to wearing mittens...because last year he was NOT having it!!!!! Birthday Bash and Doctor Appt.